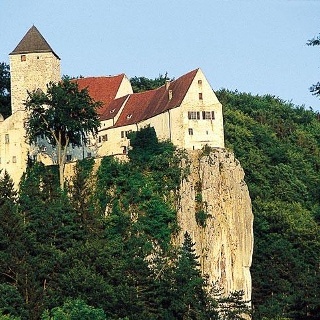 This 50 km circular tour takes you through the Altmühl Valley and along the Danube, passing places steeped in history like Prunn Castle or Weltenburg Abbey. 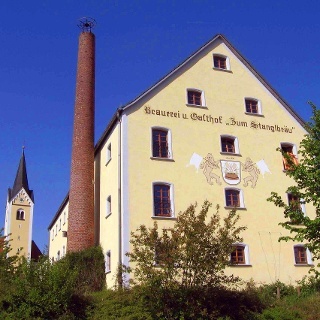 You start your one-day tour of approximately 50 km in the Wittelsbach town of Kelheim, which is also worth a day trip with its archaeology museum, organ museum and Liberation Hall. The route runs along the Main-Danube Canal. A few kilometres after the Gronsdorf Lock comes your first opportunity for a special detour: in the Schulerloch stalactite cave not only is it cooler (the temperature in the cave is a constant 9°C) but an impressive journey through time in the form of a cave projection also awaits you. On your cycle tour you will pass historic places like Essing or Prunn in the picturesque setting of the Altmühl Valley with its sheer rocky sides. 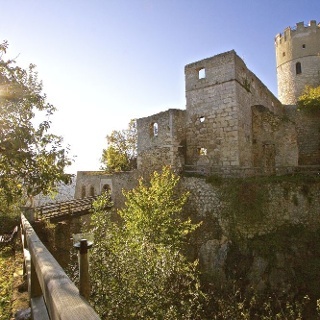 It’s also worth making the energetic detour to the ruined Randeck Castle or Prunn Castle, both towering above the Altmühl Valley. Shortly afterwards you reach the pearl of the Altmühl Valley, Riedenburg. As well as the many culinary delights on offer, the falconry on Rosenburg, the Crystal Museum and the Klingendes Museum devoted to radio and communication await your visit. After a short stopover in Riedenburg you follow the Schambach Valley railway line cycle path towards Buch. 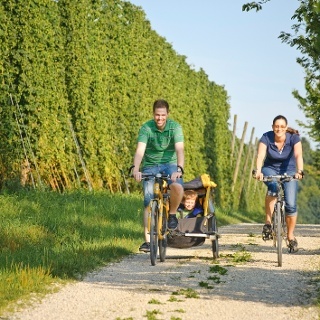 You and your eBike now face an ascent of no less than 120 metres before you can take a well-earned break in Echendorf with its interesting farm museum. 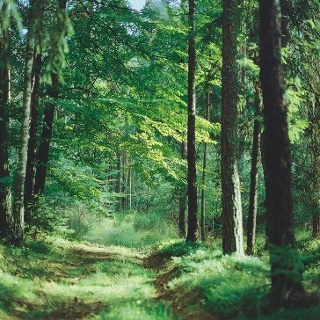 The route then carries on through the extensive and shady Hienheimer Forest. Shortly before you hit the Danube again, you will cross the Limes. After crossing over via the cable ferry (note ferry times or phone 0151-23313996 for details) you can treat yourself to a break at the beer garden. A side trip to Abusina Roman fort is not to be missed. You go on via Staubing to Weltenburg with its world-famous abbey, situated at the entrance to the Weltenburger Enge nature reserve. 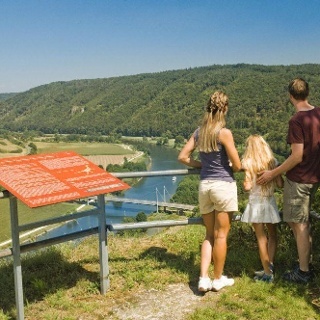 After a visit to the Asam church and the abbey brewery, you have a choice: you can either climb Weltenburger Berg hill on the Danube cycle path, or relax and enjoy the last stage on board one of the passenger boats and see the fascinating and impressive rock formations of the Danube Gap before returning to Kelheim. Especially if you are travelling with children, it’s worth visiting the Crystal Museum in Riedenburg, which has a minigolf course and seats made out of rustic barrels. - Bike-Energy Ladesäulen in Kelheim (gegenüber Tourist-Info) und Riedenburg (Tourist-Info im alten Rathaus). Adapter können jeweils in der Tourist-Info ausgeliehen werden. 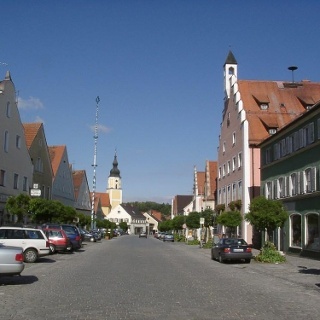 The starting point of the tour in Kelheim is easily reached in about 6 km from the railway station (Saal) on the Regensburg-Ingolstadt line. Timetable information is available from Bayern Fahrplan. The Danube is crossed by cable ferry in Eining. This operates daily during the season except on Mondays. For times please contact the ferryman on 0151-23313996. Alternatively, both the section from Kelheim to Riedenburg and the section from Weltenburg to Kelheim can be completed by boat. Timetable information is available here.